New technologies have evolved and developed over the years in various fields and so it is in the world of music. 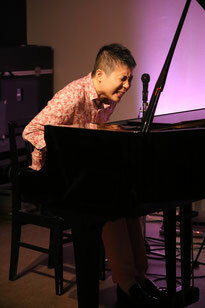 However, Asada sticks to the piano and drum performance that is simple yet colorful and full of humanness. No complicating techniques or electronic performance. What Asada aims to do is to create the imagery with real sounds with his emotions directly put into improvisation. For concerts (for kids, elderlies, etc. ), performance at weddings and funerals (recorded or live), BGM compositions, etc., please feel free to contact us. Asada will provide you with the music that matches your needs. Participatory type events also possible. Lecture on the “Possibility of Music” also available. Music that matches their needs which include fun activities for dementia and depression. Creating music for certain scenes and lines are also possible. © Ryota Asada All Rights Reserved.